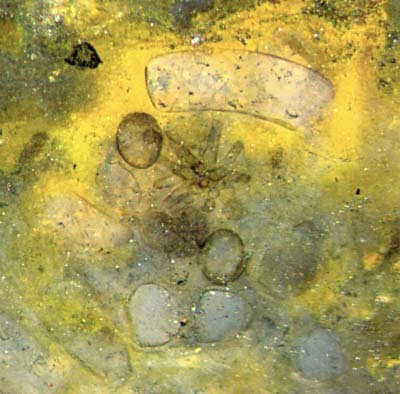 A Lower Devonian alga with unique features has been found lying prostrate in an old fragment of Rhynie chert. The sample is so narrow that it could hardly contain larger parts of the plant. Luckily, it shows about 20 structured sections on the raw surface and on the cut faces, apparently from upper regions of the plant. A well-oriented cross-section is seen in Fig.1. The 3D-structure of this complex organ superficially resembling a flower with stamens can be deduced from this cross-section and from incomplete longitudinal sections, Figs.2,3. The countless separate sections of other twigs also seen on the faces are not suitable for a reconstruction of the whole but suggest an interpretation as a charophyte Green Alga. 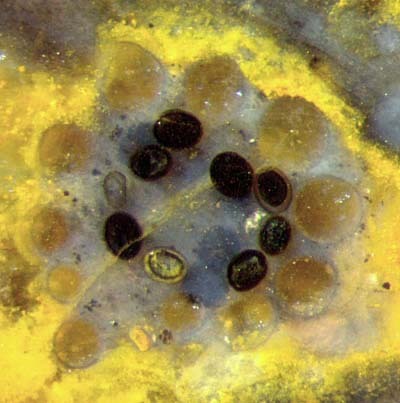 Fig.1 (right): Cross-section of the complex upper part of an unknown alga: ellipsoidal capsules in a basket made of 11 amber-coloured aligned twigs. Figs.2,3 (left and below): Inclined sections of baskets made of bluish twigs consisting of a few big cells in a row, serving as an enclosure for the capsules, which seem to be rotational ellipsoids with circle diameter up to 130µm. Width of Figs.1-6: 1mm. The basket made of twigs consisting of a few cells each, ascending from a basal cell, resembles similar formations with the charophyte alga Palaeonitella, except for the apparent absence of any chirality in the present case. What is really enigmatic here is the capsules. Their arrangement like stamens in a flower suggests an interpretation as antheridia but an interpretation as oogonia has to be considered, too. 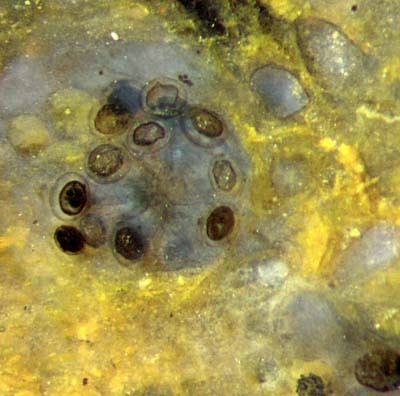 Anyway, the fossil remains highly unusual for its organs on long slender stalks, about 20µm x 150µm as seen in Figs.2,4,5, which have never been found with charophytes. Tolypella is the only extant charophyte alga whose antheridia are borne on (short) stalks. Antheridia on slender stalks are known from species of the extant bryophytes Porella, Timmia, Sphagnum, Orthotrichum, Funaria . Oogonia on long stalks are known from some Brown Algae, as Sargassum horneri, but apparently not from Green Algae. The basal cell of the basket serves as a base for the upward-bent lateral twigs and also for a central columella from which the stalks with the capsules branch off. This columella is seen in top view with slender stalks connected to some of the 12 (?) capsules in Fig.4. (It is not known why they are smaller than those in the other pictures with the same scale.) The columella is seen more clearly on the largely decayed specimen in Fig.5, with about 10 capsule stalks but only two capsules left. Not much is left of the protective basket in Figs.4,5. Fig.4: Cross-section near top similar as Fig.1, capsules connected with slender stalks to a central columella. Fig.5 (far right): Top view of columella with stalks, most capsules missing. Fig.6 (below): Lateral view of a basket made of aligned twigs. The convex outside of the basket, here incidentally on the sample surface, appears as 6 finger-like twigs in Fig.6. (One is poorly seen in the shade on the right. The twigs are partially transparent so that traces of 2 more twigs lying behind are vaguely seen through.) It is surprising that there are no capsules in the well preserved big basket, otherwise they would be seen from outside through the twigs. Less surprising are two small baskets, with 6 and 7 twigs, not shown here, also without capsules. It is not obvious what is seen inside the capsules. Some of them look empty and transparent, others are filled with black substance throughout. More interesting are those with a smaller ellipsoid inside, well seen in Figs.2-4. This could have been an inner cavity in a thick-walled ellipsoid, or the organic fill of the thin-walled ellipsoid could have shrunk away from the wall as a result of degradation. Granular fills and black stains could have been brought about by secondary phenomena. --- the columella often producing capsules shaped as rotational ellipsoids on long stalks. 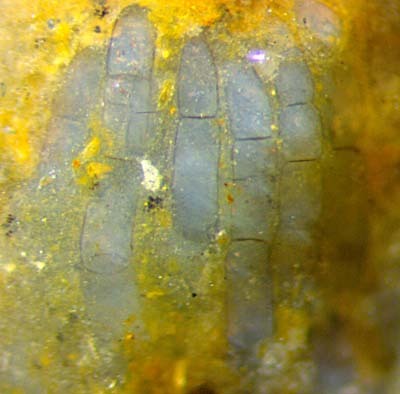 The branches consisting of big cells in single file resemble those of extant and fossil charophytes, as Palaeonitella, and an earlier described unknown alga from the Rhynie chert with another enigmatic detail possibly related to reproduction. (See Rhynie Chert News 48.) As an intriguing fact, the stalked capsules of the present fossil differ much from any reproductive organ of extant and fossil charophytes as we know them. 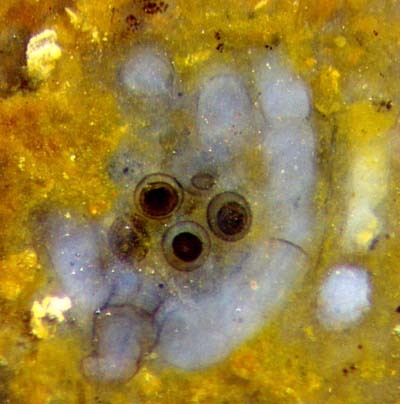 The present find confirms the supposition that branches consisting of big alga cells like those of Palaeonitella do not necessarily indicate a close relationship among the respective fossil species. 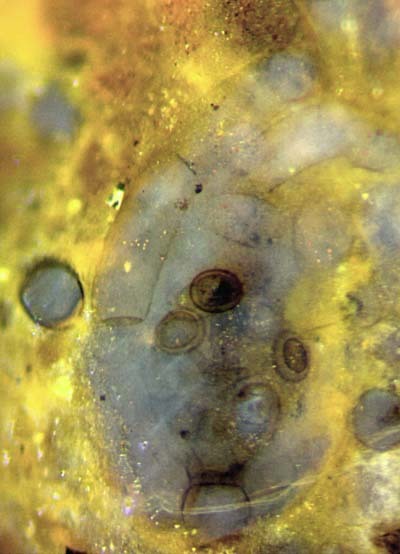 All pictures (same scale and width of 1mm) have been taken from one chert sample of 0.16 kg found by S. Weiss in 2013. G. Throm: Biologie der Kryptogamen II, p.523, 598.